Photo taken of St. James. Khun Pier found himself under house arrest in his father's VIP Guest house (now the Oriental Hotal). The only person he was allowed to see was his bosom friend Phya Pipat Kosa (Louis Xavier). At that time, Khun Pier had several wives and already a number of children. After several months of house arrest, he was released and took up legitimate residence at the VIP Guest house. It was here, through Phya Pipat Kosa, that he was introduced to Mr. H.N. Anderson, a Dane who had come to Siam to open a trading business. Through Phya Pipat Kosa, Mr. Anderson was introduced to Chao Phya Bhanuwongse (Tuam) who consected to have his son become a partner in the business, as well as to use the VIP Guest house as his offices. That was the beginning of the Oriental Trading Company which became the Oriental Stores and, within the next decade, the East Asiatic Co., Ltd., was founded. Within his frame work, Chao Phya Bhanuwongse's VIP Guest house became the property of Mr. H.N. Anderson and the Oriental Hotal came into being., but that is another story. But I have set the record straight! Let us get back to our narratives, as Mother Destiny had a lot more in store for Khun Pier! As had already been mentioned, Khun Pier accompanied and studied with H.R.H. Prince Sawati at Oxford University. Before that it is believed, he had accompanied H.R.H. Prince Pitsanuloke and H.R.H. Prince Wajirawudh to Indonesia and Russia. Khun Pier's charming personality and becoming manners, especially his knowledge of English, as well as his ability to communicate with foreign personalities with ease, was reported by the princes to His Majesty. In a pink fit, he went expecting the worst. His Majesty bagan by giving him a talking to, and ending up by telling him that he was to report to the Ministry of Foreign Affairs for briefings and orientation as a diplomat. As he had now entered government service, he could no longer be involved in private commercial business, so the partnership with Mr. H.N. Anderson was dissolved, but Mr. H.N. Anderson still occuped the VIP Guest house as his office. 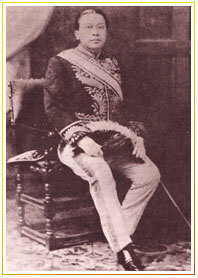 Within six months Khun Pier was made a nobleman with the title of Phya Raja Nuprabandh. His receiving this title was quite unique, as one had usually had to be a Khun, then a Luang to become a Phra and then a Phya. But that was not the case of Khun Pier. He became a 'Phya' without going up the normal steps. But what nobody knew, except a few, was that King Chulalongkorn was planning a state visit to the Imperial Court of Japan to be made by the Crown Prince H.R.H. Prince Wajirawudh, and His Majesty wanted to make it as impressive as possible. As soon as Phya Raja Nuprabandh (Pier) was aware that he was to be designated Minister Plenipotentiary to the Imperial Court of Japan, he requested that his two brothers, Khun Thep and Khun Tew, be his attaches. His request was granted. The State visit was a complete success, even better than anticipated. Phya Raja Nuprabandh (Pier) was awarded the fourth class of the Order, of the Rising Sun, and King Chulalongkorn decorated him. 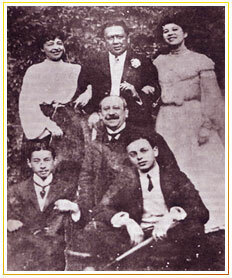 After just one year in Japan he was transferred in 1904 to be Minister Plenipotentiary to the Court of St. James. He was accompanied by his two brothers as attaches with his wife and four children, Nian, Thirt, Thip and Toon. During the first eighteen months as Minister to the Court of St. James, Belgium and the Netherlands, Phya Raja Nuprabandh (Pier) was one of the most popular personalities in the Diplomatic Corps. He was well received in the Court of St. James by King Edward VII, decorated by the King of the Belgiums and warmly received by the Royal Court of the Netherlands. In high society he was well received, his personality and his fetching ways, especially, his knowledge of English served him well. His personality disposed everybody to like him.